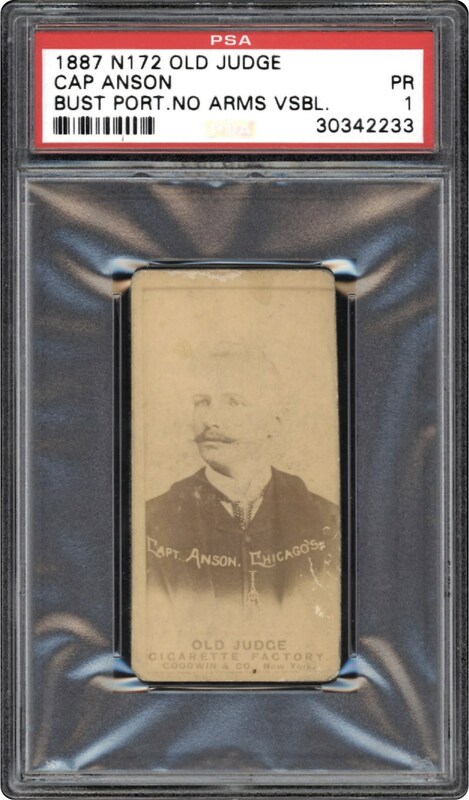 Adrian "Cap" Anson's iconic portrait image affixed to the stiff blank back cardboard has become one of the hallowed hobby cardboard collectibles, especially for 19th century purists. 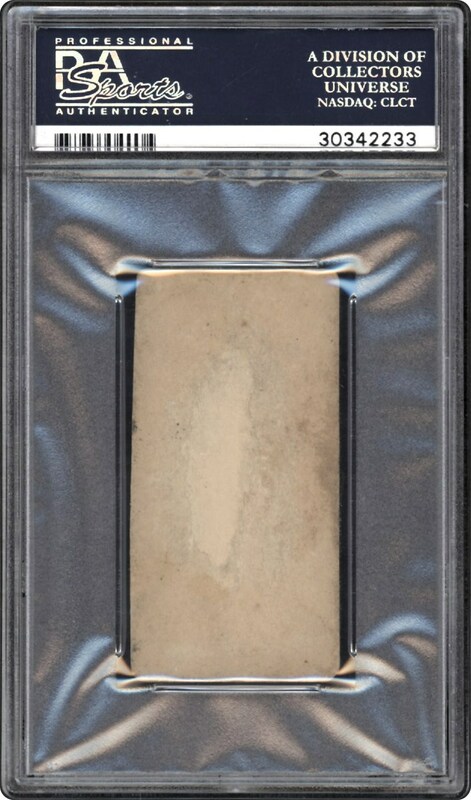 Presented here is the revered Cap Anson N172 Old Judge specimen in a PSA 1 PR holder, with the image representing the "11-1 Bust Portrait, No Arms Visible" subject as presented in the renowned periodical "The Photographic Baseball Cards of Goodwin & Company (1886-1890)." Cap Anson's premier status amongst 19th century enthusiasts is no secret. The Hall of Fame 1st baseman of the Chicago club was the first member of the illustrious 3,000 hit club, and ended a remarkable 27-year career with a .329 lifetime batting average. Furthermore, he clubbed 97 home runs (once hitting five dingers over a two-game span) in an era where only a handful of round-trippers was a formidable feat. The offered example exhibits the typical lightly contrasted sepia-toned portrait image of the immortal Hall of Famer seen on most of the Cap Anson subjects. While rounded corners, a few faint surface abrasions (near the upper and lower edges), and some modest back damage account for the grade, fortunately the critical central image has remained relatively unscathed. The significance of a Cap Anson Old Judge subject cannot be overestimated for it provides us with a direct link to the origin of our revered game, with this eye pleasing heirloom one of the most coveted 19th century cardboard treasures!